The main activity of the OKO Group for many years has been the Development & Manufacture of “Preventative Tyre Sealants”. Other innovative products, OKO Pressure Check & OKO Protective Glove have been developed recently and now form part of the OKO Group Range of products. The OKO Group is dedicated to innovation, the environment & Safety. One of the biggest problems associated with tyres is the environmental problems concerned with the safe disposal of used tyres. The UK alone produces almost ¾ of a million tonnes of scrap tyres per annum. The cost associated with the disposal of these tyres is increasing. 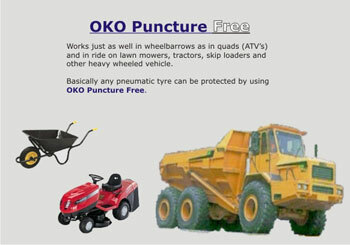 OKO Puncture Free keeps tyres serviceable for longer. Having tyres at the correct pressure also enables vehicles to use less fuel. The OKO Puncture Free Tyre Sealants and OKO Pressure Check Tyre pressure monitor valves are designed to increase and extend the useful life of a tyre. Because OKO Puncture Free prevents flat tyres by sealing punctures the moment they happen – forever, In whatever industry, in whatever vehicle, tubed or tubeless tyres can now be protected permanently against punctures. OKO Puncture Free seals punctures the moment they happen, creating a permanent seal with negligible loss of air pressure. OKO will seal holes in the tyre tread area caused by puncturing objects up to 9mm in diameter. 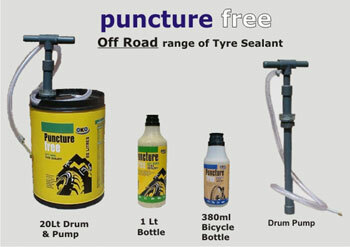 In Off Road situations, on average 95% of punctures in the tread area of a tyre will be sealed by OKO Puncture Free. JCB, Manitou and many others fit OKO Puncture Free as OE and also sell the product into their distributor network world wide.